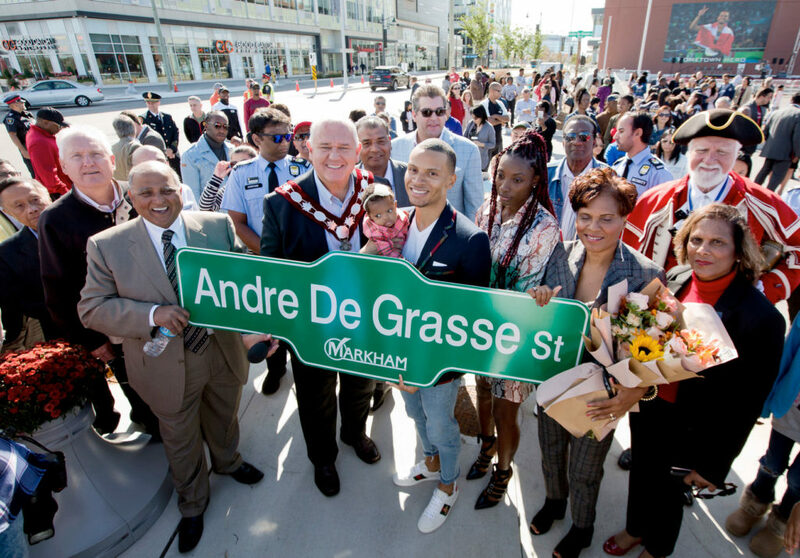 An enthusiastic crowd joined the celebration on September 22nd, 2018, as Andre De Grasse Street was unveiled in Downtown Markham. The Canadian Olympic medal-winning sprinter arrived to the ceremony in style in a vintage red pick-up truck. De Grasse thanked the crowd and his many supporters throughout the years, including his mother, Beverly, and long-time coach Tony Sharpe. Mayor Frank Scarpitti thanked De Grasse for his service to the community and the guest of honour presented Chris Bratty a signed Andre De Grasse Street sign as a token of his appreciation to The Remington Group for its support at a VIP Reception at the Toronto Marriott Markham following the ceremony. De Grasse, the first Canadian sprinter to win three medals in a single Olympics, captured silver in the 200m and bronze in both the 100 m and 4×100m relay at the 2016 Summer Olympics in Rio de Janeiro. De Grasse, the reigning Pan American champion in the 100m and 200m, is also the NCAA men’s champion in the 100m and 200m. He is the current Canadian record holder in the 200m and won bronze in the 100m and the 4 × 100m relay at the 2015 World Athletics Championships in Beijing. Watch for him at the 2019 World Track & Field Championships.